But big obstacles remain. One is fishermen’s continuing distrust of their soon-to-be-new neighbors on the outer continental shelf. “All of the developers have approached us…and we’re having a hard time finding people who are willing to be FLOs (fisheries liaison officers),” said Annie Hawkins, executive director of the Responsible Offshore Development Association (RODA), a coalition of fishing groups that organized to deal with the advent of ocean wind power. 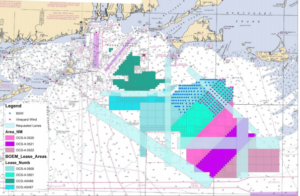 The group helped convince the federal Bureau of Ocean Energy Management in fall 2018 to put wind developers on notice that safe transit lanes for fishing vessels will be a condition for building turbine arrays in southern New England waters. RODA’s proposed lanes are now part of a review process that will bring a draft proposal later this year, said Coast Guard Lt. Cmdr. Joshua Buck. Fishermen need to get their expertise into those deliberations, but many of them eye with suspicion anyone from their ranks who takes a job building communication between the industries, Hawkins told a packed workshop at the IPF19 wind energy conference in New York April 10. “ ‘Sell the wind thing,’ is how they see it,” she said. With the first commercial offshore wind energy project in federal waters to start construction in 2020, RODA brought some experienced hands to the conference: fishermen Merlin Jackson and Colin Warwick, who advocate on behalf of fishermen in the United Kingdom and Scotland on issues of offshore wind power development there. “Merlin was on the cutting edge, he had a lot to deal with and no backup,” Warwick said in introducing themselves, recounting how he in turn got involved “trying to repair the damage that was done” in those early years. Jackson, a fisheries liaison officer for the Thanet Fishermen’s Association, said government and industry looked simply at wind conditions and suitable bottom for turbine foundations when they “drew a bullseye” on the Thames River estuary, without considering the effect on traditional fishing. Now the region’s fishing industry “is on a knife edge … the ones that are left are the real hard-core guys who have been at it for years and are hanging on,” said Jackson. In the North Sea off Scotland, fishermen are working around the wind industry and “pricewise, it’s been fine” with high demand for seafood now and boatyards backed up with orders for new vessels, said Warwick, chairman of a national fishing liaison effort.